Do you want to enhance the performance of your truck? The Wanda ATV tires are a great choice if you want a solution to traverse mud, rocks, desert and other dirt trails. However, you should ensure you get the best Wanda ATV tires for ultimate performance. Also, not all tires suit your budget, but these are cheap Wanda ATV tires that can give your truck enough power to handle your tasks. The 4 Set Wanda ATV/UTV tires have royal users due to their reliability and quality. The set includes 2 rear and 2 front tires for excellent functioning. Exceptional tread depth offers additional traction while giving your truck stability. Are these tires good for your vehicle? Read below for the Wanda ATV tires review for more details and specifications. Learn more reviews : The Interco ATV Tires Swamp Lite Review , ITP Mud Lite AT Mud Terrain ATV Tire (25X8-12). 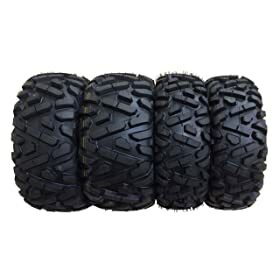 This new ATV/UTV tires comes in a set of 4. These include two 25×8.00-12 front and two 25×10-12 rear tires. Thus, if you choose these set, you will get a full set for entire replacement. So you will not have to shop for additional tires since these cheap Wanda ATV tires are an excellent solution. The tires are not directional making them perfect medium and large utvs. The Wanda ATV/UTV tires have a deep tread depth for excellent traction. However, the tread depth is specific for both the rear and front tires. The tires have a tread depth of 20 mm. The front tires have a rim width of 6.5 inches and 370 pounds @ 7 PSI. On the other hand, the rear tires have a rim width or 8 inches and 420 pounds @ 7 PSI. With this tread depth, you can use your truck on multiple surfaces without getting stuck. Also, the tread patterns offer enough stability and support for your vehicle. Their design gives your truck an aggressive look and power to continue moving even in the worst weather. With these tires, you are ready for the winter and summer and to carry large and bulky luggage. Additionally, they offer a smooth ride to make sure you are comfortable and to prevent spoiling delicate luggage. Are you looking for tires that are easy to handle on any surface? The Wanda set of 4 tires may be all that you need. These tires allow excellent handling in the dirt, mud and even on rocky surfaces. You will enjoy superior traction in woods so your truck will not get stuck. Also, they are great in the desert. These tires feature a 6 ply design making them supper durable. You will use these tires for many miles and still enjoy smooth rides. However, their durability may be affected by the surface. If you use these tires 75% on road and 25% off road, they can last 2 years or even more. The heavy 6 ply design nylon design makes them puncture resistance. Unlike similar mud tires that get constant punctures, this model will stand strong. They are tubeless so you will not require tubes to mount them. The Wanda premium ATV/UTV feature high-abrasion design so they stay as good as new for long. With additional shoulder lugs, these 4 tires remain in a good condition for long. The additional shoulder lugs help to protect sidewall and rim. A sure rugged and aggressive design will serve all your travel and carriage needs. The shoulder lugs appear comparatively different from similar tire models which will give your vehicle a dynamic and aggressive appearance. The 4 set Wanda tires boast of their multi purposes nature. You can use them on various truck models provided they fit. The manufacturer aims at offering truck owners a chance to enjoy quality. That’s why the tires were not designed for a particular vehicle model. Moreover, their multipurpose nature makes them the best Wanda atv tires on the market. • They don’t come with a manufacturer’s warranty. • You require assistance to install these tires. How do the 4 Wanda ATV/UTV tires compare with other models? First, these tires come in a set of 4, a complete solution for your replacement needs. Also, these tires are specifically designed for the rear and front with specific rim width. Thus, they are not like similar heavy-duty mud tires that come in single. Like most mud and ATV tires, the Wanda tires feature 6 ply design; this design is meant for durability and puncture resistance. However, their tread depth may not be as deep as in comparable tires. But the depth helps offer traction and stability. Similar to most mud tires, this model can be used on various vehicles and can travel on numerous surfaces. Unlike other tire models, the Wanda tires are affordable, tubeless and hold much weight. The 4 set Wanda ATV/UTV tires don’t come with a manufacturer’s warranty like similar mud tires. With the best ATV/UTV tires, you can power your truck to perform in harsh conditions. The best Wanda atv tires are specifically designed to offer excellent performance in dirt, mud and even on rocky surfaces. The 4 set Wanda ATV/UTV is such powerful tires. They come with an aggressive design and relatively deep tread pattern for traction in numerous roads. You can be sure these atv tires will not wear soon since they have extra shoulder lugs to protect sidewall and rim. If you want durability, these tires are still a good choice. They have 6 ply construction for durability and puncture resistance. Also, purchasing 4 tires at once is a great idea since you will not have will only place one order. You will also upgrade all the truck tires at once, thus, improving performance. I hope you found the wanda atv tires review useful. Now you can make a guided choice. You can choose these tires for your vehicle since they are among the cheap wanda atv tires and offer excellent performance.